Abstract: Intermodal hubs are a component of freight transportation networks that have as main goal to deliver cargo at the agreed time and at the agreed location. Currently, authorities are forcing transport operators to act in more sustainable ways. For intermodal hubs this is translated into making a preferable choice for sustainable transport modalities. In some cases, this is no longer a choice and is imposed on the intermodal hub in terms of a desired transport modal split. In this paper, a heuristic based on Model Predictive Control (MPC) to achieve a desired transport modal split at intermodal hubs is proposed. 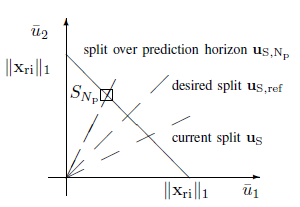 A terminal state constraint is used for the quantity of cargo assigned per modality over the prediction horizon to guide the cargo assignment. Feasibility of the optimization problem and cargo delivery at the agreed time are assured by relaxing the terminal state constraint. The proposed heuristic can anticipate the transport of cargo due to the inclusion of predictions, leading to a push of cargo towards the final destination. As cargo is moving in anticipation to the due time the transport is more robust to unforseen events, such as jams and weather conditions. The proposed heuristic is a step towards sustainable and synchromodal transportation networks. Simulation experiments illustrate the validity of these statements. Reference: J.L. Nabais, R.R. Negenborn, R.B. Carmona Benitez, M.A. Botto. A constrained MPC heuristic to achieve a desired transport modal split at intermodal hubs. In Proceedings of the 16th International IEEE Conference on Intelligent Transportation Systems (IEEE ITSC 2013), The Hague, The Netherlands, pp. 714-719, October 2013.